This method should be used when an individual visit or movement needs to be anonymized, as opposed to all of the visitors history. In this case, all or some of the visits can be anonymized from the 'Timeline' tab. *Please note, visits can only be anonymized from the Timeline tab in the Visitors page and only signed-out visits can be anonymized. Navigate to the 'Timeline' tab from the Visitors page and select the visit/s you wish to anonymize. 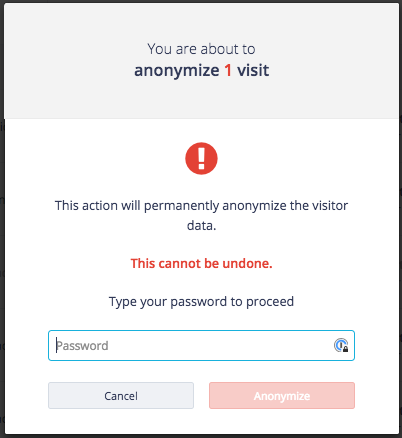 Confirm the action by entering your login password and click Anonymize. Once the visit is anonymized, the data will appear as shown below. You have now Anonymized a visit! You can check the result of your action by refreshing the Timeline tab. You should now see the row entry with all personal information removed. In busy times, this process may take a minute or two, so please refresh you page.